There are several categories of funds that have outperformed VTI. As is demonstrated above, the Small Cap (IJS), the equally weighted S&P500 (RSP) and the NASDAQ (ONEQ) have all outpaced the more everyday indexes, VTI, DJIA and S&P500 over the last 10 years. VTI is still ahead of the S&P500 and the DJIA however. IJS tracks small cap stocks. It is one of ?? funds committed to tracking small cap, value stocks. 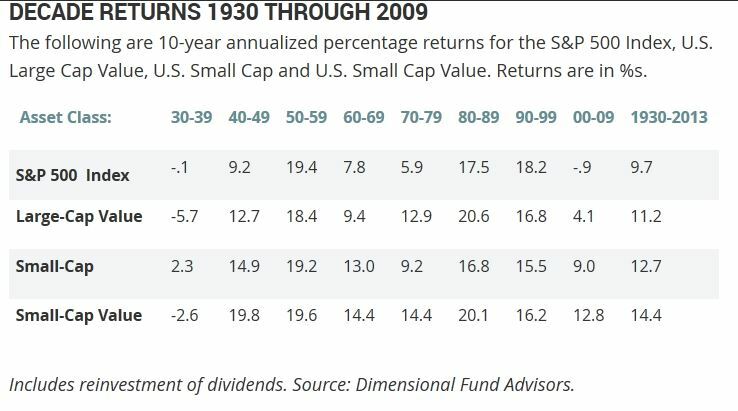 The performance of small cap, value stocks has been surprising over the last 88 years. As you will see from the various research summaries presented below, there is every indication that the Small Cap Value asset class does outperform any other asset class. From Dimensional Fund Advisors, Small Cap Value wins every decade! Yet another analysis, this one done by the prestigious research firm Ibbotson. Ibbotson Associates is a registered investment advisor that is now part of the Morningstar Investment Management division. A leading authority on asset allocation with expertise in capital market expectations and portfolio implementation, Ibbotson Associates approaches portfolio construction through a research-based investment process. Its experienced consultants and portfolio managers serve mutual fund firms, banks, broker/dealers, and insurance companies worldwide. While this table only goes through 2002, it demonstrates that Small Cap Value consistently outperforms every other asset class. And, it also shows that vendor selection when buying an ETF is important. Not all indexed funds perform equally even though they presumably are invested in the same asset class.